I recognize this not our usual blog for this website but we all felt that this is needed shared here this week. We will be back with another wonderful blog to inspire your events and playtime. As this day precedes along it's course I want to take a look back and encourage us all to move forward. This week has been a hard one for our country marked with tragedy and sadness. My prayers go out to those in Boston and in West,TX. This week has been especially marked for those in Oklahoma. Today April 19 at 9:02 am in 1995 is not only the day the Murrah building in downtown Oklahoma City came partially crashing down but also the day our lives came crashing to a stand still. I still remember that day. I was in Biology class in highschool when something dropped and rolled across the ceiling of the school or so I assumed. Turned out to be the rumble from the blast miles away. The look on my teachers face as she came back in the room after being called in the hallway still is etched in my memory. I remember one of my friends sobbing because her mom was supposed to be downtown that day and she not able to get a hold of her. She turned out not to be near the building and ok. I remember wandering from TV to TV in the hallway with my friends numb and not able to grasp why anyone would do such a thing. I remember going from class to class only to sit and watch the news because no one was sure hat to do with us students so they kept us at the school even though no one as in any kind of frame of mind to teach or learn. I remember coming home to knowledge that my stepdad was one of the many rescuers( he was a firefighter) down there digging to through the rubble trying to find those lost and those who may still be alive but trapped. I remember how our city and state pulled together immediately to do all we could to help. I remember the news anchors swarming downtown trying to get the story and even a few who thought they deserved to be in places no one but emergency workers were supposed to be in because of who they were. I remember the blur of information the day of and the days following. I remember the pictures and videos from that day. I remember going back to school that week and the dark cloud that hung over the school. Every time I hear Lighting Crashes by Live I remember that day. I remember the lives lost. I remember the tree planting ceremony at our school in remembrance of those lost lives. I also remember rebuilding. Watching the rest of the building being brought down and the building of our beautiful memorial in it's place. The museum being built to help remind and educate the generations to come. Just like those who lived during the time of JFK's assassination this singular day will be etched into many Oklahoman's memories. Just like the entire nation on 9/11 we came together, regrouped and rebuilt. Every year we remember that moment and this is year no different. Only more marked because of the awful events preceding this day. As the news continues to flow and we learn more of the events in Boston and West,TX let's remember that the darkness of a terrible event can not extinguish the light of love and hope. That through the pain lessons can be learned. Let's remember together we will make it through this and any other events that may come our way. Don't let a day slip away with out telling your friends and family how much you care for them and those that you may be having a difficulty with that you are sorry or that you forgive them. Remember in your prayers to be thankful of the blessings you do have and not just your worries or fears. We have a new line about to roll out. Something to help all those busy moms and dads out there. Have a little girl who loves watching all those princesses on tv or have one who loves playing dress up as one. We are getting the pictures of the whole set together but we are now offering prepackaged Princess Birthday sets. The set will contain 5 tutus of your color choice, 5 wands, 5 lace crowns or halos, 5 party invites, table cover and streamers in the same color as the tutus. The prices start at $75. You can order on our custom order page now if are ready to order now before the pictures go up. 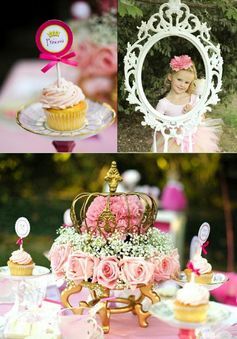 In honor of the new line we thought we would share some ideas for a princess party from Pinterest. 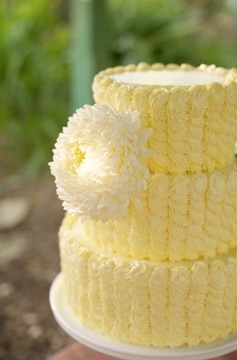 Pinterest has some really great ideas for a princess themed birthday party. Here are some of our faves. Another big trend for 2013 weddings is the use of the color mint. It really is a splendid color. Very cool and refreshing in tone and can be very theme inspiring. It lends it self well to a flowing beach front wedding, a small backyard wedding and even a large cathedral wedding. You can use the color in many ways and even the scent or flavor of mint at your wedding. I have been scanning through Pinterest to find some Pinspiration ideas to share with you. I hope these Pins inspire you as much as they have me. You could go with a lovely mint wedding dress. Like this one. Dress you brides maids all in mint. I love the mint with yellow flowers but black or brown accents would be gorgeous too. I love these shoes and if your were mixing this trendy color with another trend like the 1920's theme they would be almost perfect. You can see more about that trend here. The mix of clean crisp white and mint with a splash of gold would make your event look very elegant with out much effort. Add a sweet scent to your wedding with mint scented candles as part of your decorations. You could use mint as an accent color an walk down the isle with a mint colored bouquet like this one.Though I think a splash of color would really make it pop but this look would be awesome for a winter wedding. Whether you go with a mint colored cake or one flavored mint. You could always add sweets bar with chocolate chip mint ice cream, mints, mint flavored chocolates and more. 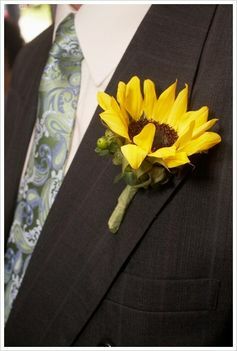 For the men you do something small like this to keep the colors going with out making them put on a mint tux. and remember you don't have a huge budget or a fancy facility to make your big day special and a little dressed even if it is at home. I love the way the colors all came together her with the white and purple. 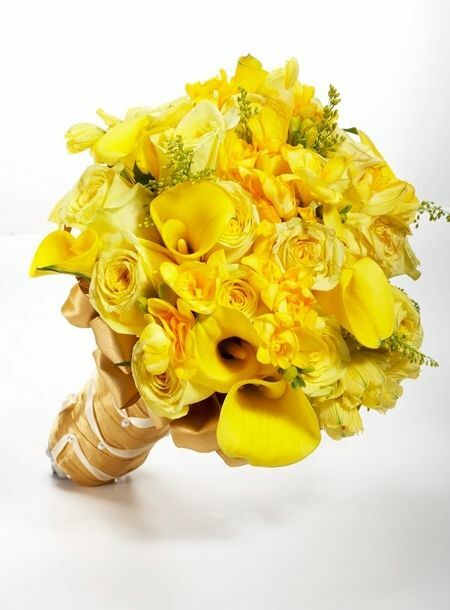 They would be ideal for a spring or summer wedding. 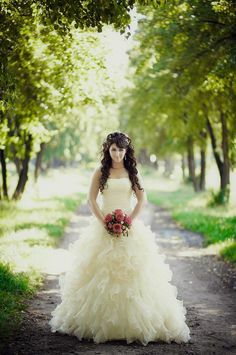 A sweet flowing and fluffy tulle tutu dress would be so sweet going down the isle at a beach or in a church. A fabric tutu would adorable on your little flower girls as they marched down the isle be at the local garden or in your backyard. Both styles would look adorable in your pictures. They are also something fun those little flower girls can take home and play in after the wedding.I can make those for you in just about any style you want. Plus if you custom order 2 or more I give discounts. So be sure to jump over to my custom order page and bookmark it for you to come back to later and order some for your wedding once you decide on a color or colors you want to do your special day in. Thank you for reading. Coming back soon for more ideas and tips. When you purchase a tulle and fabric tutu I know you want your item to look it's best for as long as possible. So here are a few tips to help you keep them as nice as possible so your little one can play with for days,weeks and even months to come. 2. If your tutu becomes wrinkly or flat use a steamer to smooth out a wrinkles and between layers to help refluff it. If you don't own a steamer a nice steamy bathroom can help with the wrinkles. 4. If your tutu becomes smelly a light spritz with Febreze or favorite fabric refresher can help with the odors. 4. 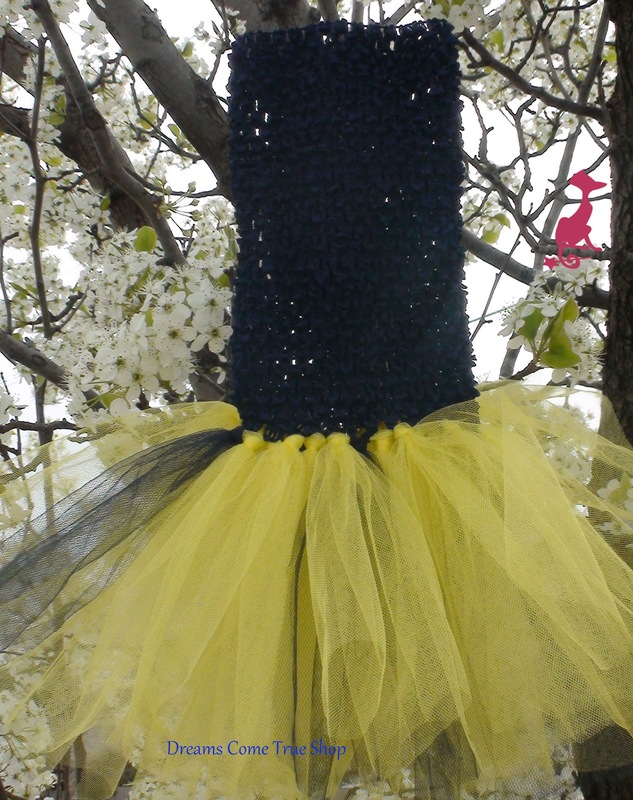 Your tutu becomes smelly using a fabric refresher can help with the odors. 5. It can help to trim the little strings that can come off of the fabric strips. Hope that helps if you have a bigger issue with your tulle tutu or fabric tutu please don't hesitate to ask . I personally love Renaissance, medieval fairs and fairy balls. They are so much fun and we are fortunate enough to have over 3 in my area and a few more in the neighboring states. You can learn some neat facts about that time (a great time to plan a theme unit if you home-school and use the fair as a fun field trip to round out the unit) and you can also let your imagination have a free day to run along side your child's and enjoy all the revelry and fantasy often alive and well at these festivals. This is a place that you can wear a costume and no one will think it one bit odd but actually condone your ability to join in on the fun. One of my tutus and ragatus are perfect as costumes or part of a costume for such festivals. Here are some ideas and some inspirations. No not all these pictures are mine but yes I can do that. 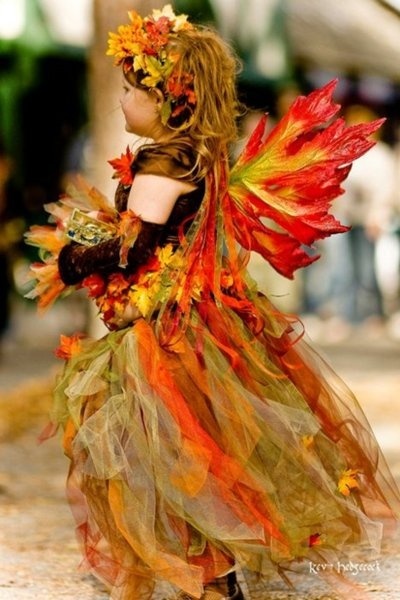 A woodland fairy princess at any age. Now I am working on a new fairy handmade wing line and will be released later this spring if all goes well and the practice rounds continue to go well. Now no prince or princess should be seen with out their crown. Yes of course I have you covered there no matter what age you are. These are my lace crowns but I have floral ones coming out later this spring. Just remember we are all dreamers on the inside and that is an ageless age so be free to go and have a little fun and forget your physical age for just a little while. Thank you for reading. Planning your little ones 3,6,9, and12 month pictures? How about those toddler and preschool pictures? Do you have a plan? Here is some ideas to think about when planning your picture session. 1. Timing. If your little one takes naps on a schedule be sure to plan around those times. Also make sure to plan around a time that is not a normal meal time for your little one. One more thing make sure that you don't plan your photo session right after a trip to the doctor. You want this to be a comfortable fun event for your little one. 2. Theme. make sure you bring along an outfit or two ( especially depending on the age) that will go with your theme, accidents happen and it is best to be prepared. If these are milestone pictures you may want to use similar themes or backgrounds to really make the growth of your little one stand out. You could go with an overall theme like playtime, birthday or Holiday as well to add a little fun and sweetness to the pictures. Be sure to discuss this with your photographer before hand. 3. Outfits. I do not suggest to many outfit changes as this can stress out your child. If this is family photos you could go with a color theme for your outfits. This can be visually appealing. 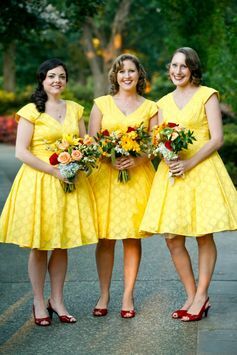 Also if you know your photographers ideas for background or settings you could chose an outfit that will compliment the theme of the setting for your photo session. Such as a white T-shirt and jean overalls could be really cute with a toddler pulling a wagon with a few teddy bears in it outside in a park. If this is a milestone picture you could chose an outfit that can grow with your child and be used to show how much your little one has grown. One last thing on outfits for your photo session. Chose outfits that are comfortable for your little one to be in. This can help to make the whole experience more enjoyable for you and your little one. 4. Props. Your photographer will probably have props already and a few ideas for your photo session, but if you have a special heirloom or a specific item you want to use be sure to tell your photogapher before hand if at all possible. 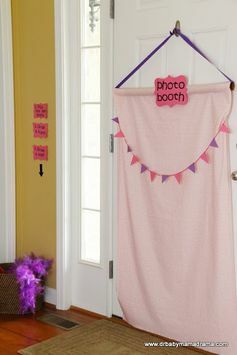 You could use a simple prop in your milestone pictures. Especially if it is an item special to your little one like a favorite teddy bear. This can also make your photo session more relaxing and enjoyable for your little one.Also make sure all of the props are safe and are being used in a safe manner. An example of this is would be propping up a barely able to sit up alone infant in front of wings on a stand (safe) on a cement floor with no padding under or around the baby (not safe). 5. Weather. Be sure to plan around the weather in your area. If it is summer and it gets extremely hot in the afternoon then plan your photo shoot to be in the morning before the heat or indoors if later in the day. Reverse that for winter. Also check with your photographer when scheduling any outdoor sessions about the ability to reschedule if there is inclement weather on the day of your photo shoot. Especially if you booked off of a special they were running. 6. Photographer. There is no need to just grab the first photographer and go. Take the time to look around. Ask some of your friends if they have a photographer they like. Look on places like twitter, pinterest and facebook. Many photographers who post on these places will have pictures posted from other sessions they have done so you can get an idea of their work ahead of time. Find out the cost up front and what that includes. Many smaller photographers run deals and specials that are just as economically priced as your in store photographers( except maybe Walmart). Also remember many smaller photographers will be more capable and willing to take the time to help you achieve some very one of kind pictures at a pace that can be more relaxing than at some of the bigger places. A smaller photographer may have fewer props or backgrounds ( or the programs to fake them) available. So talk to your top picks of photographers ahead of time to see what they can offer you.Also if you have shy child you might ask if you can set up a time for your child to meet the photographer ahead of time so your child has the opportunity to be come comfortable before you put them in front of the camera. 7. RELAX . have fun. Enjoy the time and memories you are literally making. Don't stress out over getting that perfect shot. Your little one will sense your stress and it will make the whole thing a miserable event for everyone involved. Trust your photographer who will use all their abilities to get that perfect shot for you. Also some of those not so perfect shots turn out to be more special and meaningful than the planned one. 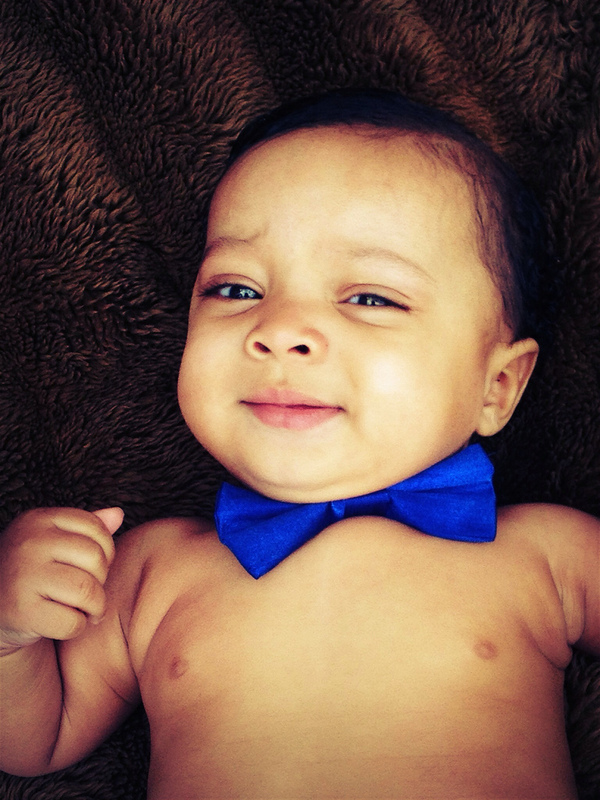 Allow your little one to be themselves. Don't push them to hold something or do something they simply don't want to. They will still give you that perfect smile when they are relaxed and having fun too. Having your wedding outdoors this spring and summer? Just because it's out side doesn't mean you have to be limited with you decor or even stifle you style. I love this one. They had their guest dress in steampunk or period dress and created a canopy from branches, moss,lace, pearls and candles. It really gives the whole event such a Victorian literary romantic feel. Want to create a feeling of escape and magic? You could dos omething like this one, it is simply stunning. 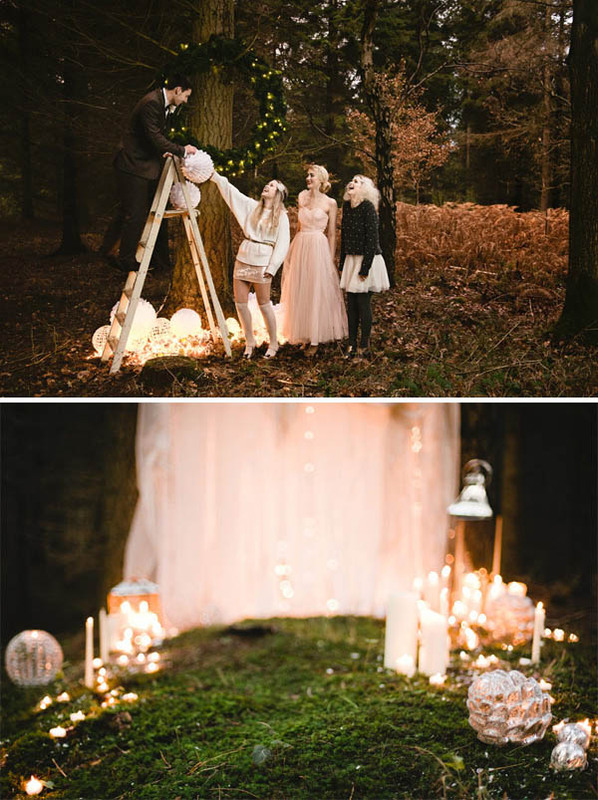 They transformed an average woodland scene into a dreamy almost magical escape by adding a moss ground cover. A soft fabric backdrop with lights behind it, candles and soft lighting along the isle. The hints of silver in the accents add to the effect. I hope some of these ideas inspired you for your own wedding. 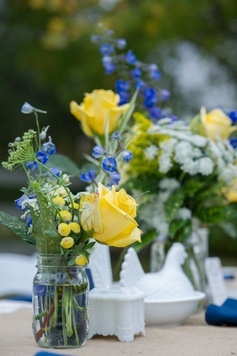 You can see more ideas on my event inspiration board on pinterest. You can also order sweet custom made crowns and halos for you, your bridesmaids and your flower girls from me as well as sweet flowing tutu flower girl dresses and brides maids tutus. Just go to my website and tell me what you are looking for and what kind of budget you have. I will be more than happy to help you make your dreams come true. 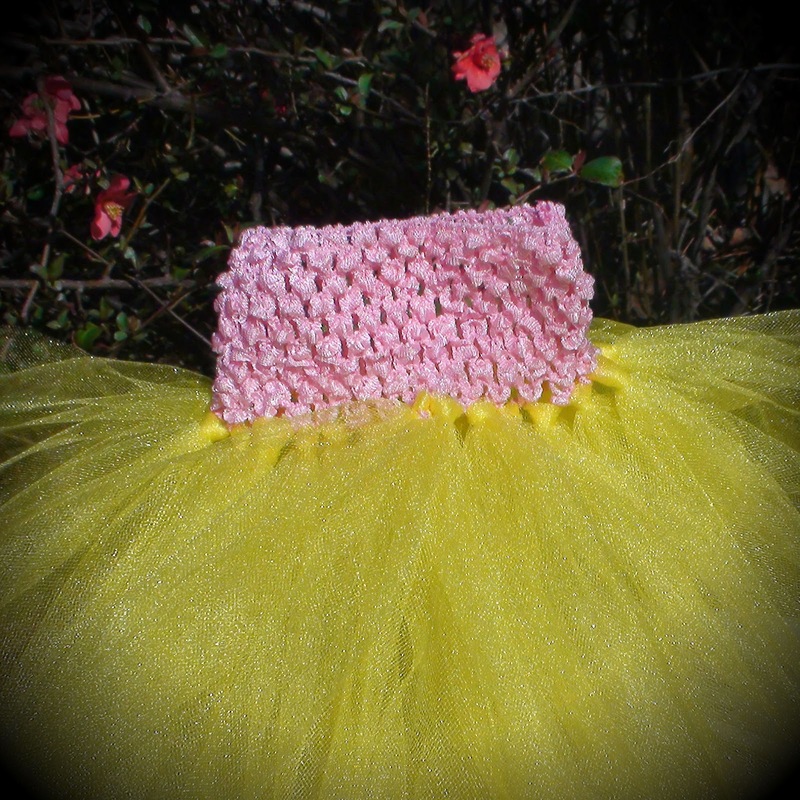 My tutus make perfect outfits for birthday parties,dress up, weddings and photo shoots. 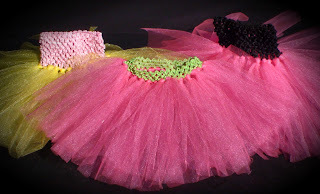 I can make a tutu any size and almost any color scheme you can think of. My custom tutus and tutu dresses can be made as thick and full as you want.These type of tutus are perfect for fantasy to vintage weddings. I also can make a ragatu ( tutus made of fabric), these are especially cute for country and boho weddings or events. Let's not forget both types are oh so cute for photo shoots like all those Easter and spring shoots that everyone is booking right now. They are also perfect and can be made inexpensively enough for a fun new play outfit. I also have the accessories to make them cute little outfits for any occasion. Here are some pictures to inspire you. To start your own custom order click here. Thank you for reading. 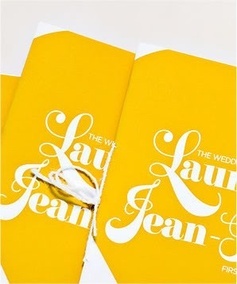 Preparing for any big event can be very stressful and planing a wedding is no exception. So when you are making your plans be sure to plan in some rest and relaxation for yourself and your soon to spouse and don't forget to do this for the two of you regularly after your big day. Plan these times to be time for just the two of you with no discussion of your wedding, family or any other stressers. Plan something that is something that is for both of you to do together that is a neutral activity. This may even lead to a new hobby for the two of you to do together. Here are 10 date night ideas to inspire you whether you are planing your wedding or have been married for years. 1. Dinner out - that's it just dinner out. Just spend an hour or more eating and talking with each other. This is a perfect way to reconnect.You can do this one with out breaking the bank by sharing a meal, watching for specials at your favorite places or even just going to McDonald's. 2. Hit your local mall - find a seat and sit and visit while people watching (pick out the couples that makes you think you two) or walk around the mall like a pair of goofy teens taking pictures of the two of you through out the mall. This can lighten the mood and give you both a good laugh. 3. Go for a walk - Stroll through your neighborhood, at your local park or at perhaps even a city lake. Walking can help relieve stress and gives you two time to talk and just hang out. 4. TV time - Sure you watch TV all the time but take a night to make a deal of it. Pick a movie you both like, make a pallet in your living room, grab a ton of snacks and snuggle up. 5. Dinner and Dancing IN - sure sounds silly but really it can be so much more fun than doing it out. Plan a fun dinner and set up a space for the two of you to get your grove on after you eat. 6. Backyard Party for two - mix up couple of your favorite frozen drinks and some appetizers. Set out the lawn chairs and plug in the radio to play your favorite music. Then just sit back, relax and enjoy the company. 7. Catch a show - Visit your local museum or go see the new ballet. Get a little dressed and make a night of it. 9. Go for a shot - visit your local gun range together. There are usually lots of experienced people happy to help you and even if you have no desire to carry a gun it will be a time together you will be unlikely to forget. 10. Puzzle night - grab your favorite drinks and snacks, pick out a puzzle and sit around the table visiting and building the puzzle together. When the puzzle is all done. Glue it together as something to remember the fun time together. Well have fun and Thank you for reading.